I decided to stay up for this match and I'm glad I did. This has always been one of my favourite ATP Masters 1000 tournaments and last night just further reinforced that. 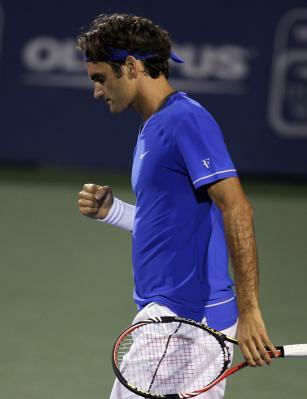 Roger played a great match – and proved he still has something left in the tank. Many Fed fans were skeptical Roger could put in the required level of performance to defeat someone like Del Potro, especially after his loss to Tsonga at the Rogers Cup, me included! This was of course justified, as Roger didn't look great in his match against Pospisil and looked even worse in the loss to Tsonga. However last night, he executed the perfect game plan to roll out a 6-3 7-5 winner in what was really a comfortable win. I was really impressed with the way Roger went about the match, he mixed it up considerably well, giving Del Potro a ton of spins to think about, which didn't allow him to settle into any sort of rhythm. As well as that, he made a concerted effort to get to the net often, and quickly. And he volleyed pretty well, as you can see below he won 11 of 13 points at the net, which second only to the 75% of first serves he made (which is an amazing stat), is probably where the match was won. The forehand was also on top form, finding its range early and hitting some trademark blows. He certainly hit it way better than he did in the Tsonga match and it seemed to have way more pace on the ball. I think perhaps the courts suit him better here, but also I think he had more confidence in that shot, knowing that if he did go for it, he'd be able to make it. Which in the Tsonga match, wasn't apparent. Roger served well from the off, and converted his first break point after the Argentine hit an easy volley long to setup the chance. From 3-1 onwards, Roger looked relatively untroubled on serve, at one point he was making 89% of first serves to Del Potros 61%. He consistently made inroads into Del Potros service games too, but he crept out of those with some solid serving. However, one break proved to be enough and he took the set 6-3 serving it out in clinical fashion. The second set looked to be heading the same way – Fed created 0-40 on the Del Potro serve, and wasted 5 break point chances. Perhaps wasted is a little harsh – he shanked a forehand return off a good first serve, Del Potro then smacked a forehand winner behind a big serve, and then Roger netted a make-able-ish forehand to allow Del Poro to get to deuce. There's usually uproar on twitter when Federer lets break points slip, indeed he's let players off the hook before and gone onto lose matches, but I don't think it's too much of a big deal as long as he keeps creating the chances. And if he's serving well like last night, the chance eventually comes and he takes it. Del Potro definitely upped his level in the second set, and at 2-3 with Roger serving, he fashioned his first, and last break point of the match, which Roger saved with a strong serve. From there Federer continually made inroads into Del Boys serve, plenty of 0-30's, and he finally made the breakthrough at 5-5 in the set. He served it out well after a couple of errors to make it 30-30, sealing the match 7-5 and heading into the next round where he will face James Blake in a repeat of the 2007 Cincinnati final, which Roger won in straight sets. I thought I played a wonderful first set and a very good second set, too. That was obviously enough tonight. I don't think I really allowed Juan Martin to be able to play the game he usually plays. I really think Blake has always been a bread and butter opponent for Roger. He's capable of hitting huge shots and plays an aggressive game, but every time I've seen Roger play him, he has an ability to make Blake look stupid on court. I guess the 9-1 H2H in Rogers favour is testament to that, with Blakes solitary win coming at the Beijing Olympics in 2008. They haven't played each other since 2009 in Madrid and Blake is knocking on a bit now in terms of age. He is however on a good run of form at the minute (well pointed out by Duong who left a comment on my earlier Cincinnati 2011 Draw post, he correctly picked him to be Feds opponent in the round of 32) but despite that, I still see Roger having way too much for him, and strolling out a comfortable straight sets winner. 6-4 6-2. I guess it's also worth noting, they've played each other twice in this tournament previously – in '05 (1st Round) and '07 (Final), with Roger winning both in straight sets. So on paper, it would seem he holds all the aces. I'll leave you with 2 of my favourite points of all time – taken from Federers victory over Blake in the 2008 Australian Open. You'll see what I mean about how he makes Blake look stupid – he plays the best possible points, and comes out on the losing side both times. Truly awesome. And even better considering we know Fed had mono in this tournament, and a bad back! Federer v. Blake, 2nd set tiebreak from RFF on Vimeo. 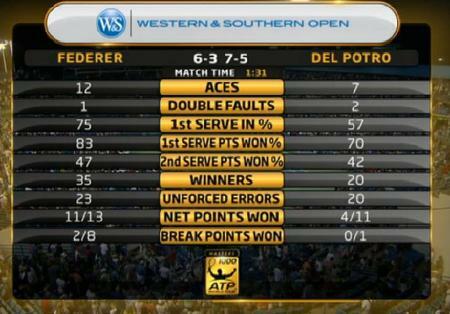 I think Del Po’s win was very important for Roger’s confidence, and his game for the final break was great. Now I have more hope for the rest of the tournament, even if next matches are not easy, especially the one against Berdych. Before likely a semifinal clash against Novak. But we will see how Roger manages to break Blake since his ability on return will be very important, esp in Cinci. Me too – it was a very good win. Not only to avenge his previous two defeats to Del Po, but for a big boost heading into the US Open. I didn’t watch the Blake vs Bagdhatis match, but I guessed it would be tight. I think Roger will use the chip and block returns well against him, and Blake will just commit too many errors and eventually lose it mentally. We shall see tonight though. 7.00pm local time, looks like another late one for me.